Relocating your home or office to another country can be a stressful experience, unless of course you have the entire project handled by professional movers such as ourselves. We offer a specialised international removal service to all private and business clients in London. At first glance moving overseas can seem like a daunting task, but some professional expertise will go a long way in making everything swift, efficient and hassle-free. We know what the crucial aspects of international relocations are, and always make sure to have those taken care of properly. Organising the removal is perhaps one of the most crucial aspects of the entire project. The team of Removals 247 understands that there are quite a few considerations and issues to account for when moving over such long distances so we will assist with planning, scheduling and preparing for the relocation. We will arrange for a visit with one of our removal specialists who will sit down and discuss your needs, budget, timeframe and any other specifics which must be factored in. Once everything is sorted out in terms of planning and scheduling, we move on to actual prep work for the removal. Preparing to move a home or office overseas will require some time and effort so please give enough time to deal with this stage properly. Moving internationally usually involves a paper trail of documents to be signed, copied, sent to places etc. If all the documentation regarding your relocation seems too confusing (even contradicting sometimes) by all means let us know and Removals 24/7 will do our best to help you out with all the forms. We are generally pretty good with UK transport documents and customs forms. Keeping international moving costs within reasonable limits is highly important. 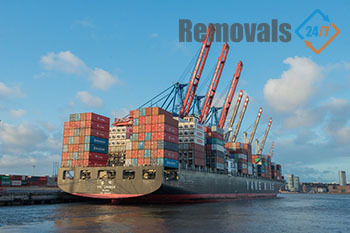 Obviously though, certain expenses associated with international removals cannot be offset or bypassed. Nevertheless we will do our best to work out an affordable way to relocate everything safely and efficiently without allowing for any unnecessary expenses to be incurred. London’s West End is traditionally the place to be for theatrical performances, and has been so for the last few hundred years. One of the most famous performances given in London was that of William Shakespeare in 1599 at The Globe (Bankside, Central London). Nowadays, people can choose from over two hundred shows played in London’s West End every day. Expert moving services - seven days a week.